Fans of tower defense games have probably played, or at least heard of Fieldrunners. The popular game hit the App Store a few years ago, and has been downloaded hundreds of thousands of times since its release. 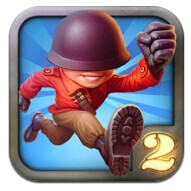 Yet a successor has now arrived – Fieldrunners 2, and it seems to be no less exciting than the game's first installment. Fieldrunners 2 features a total of 25 unique levels across 4 different zones of Fieldrunners Island and over 20 weapons that can be chosen at the start of each stage. There are more than 30 different enemy types, including bosses that are tougher to kill, but reward you generously. There are a few new game modes as well: Sudden Death, in which endless swarms of enemies are released against the player, and Puzzle Maps, which put the gamer's understanding of the enemy's behavior to the test. There are even more goodies that make Fieldrunners 2 better than its predecessor, but we won't spoil the fun and will leave them for you to explore. Everyone who is interested is free to grab the game, priced at $2.99, for their iPhone or iPod touch.